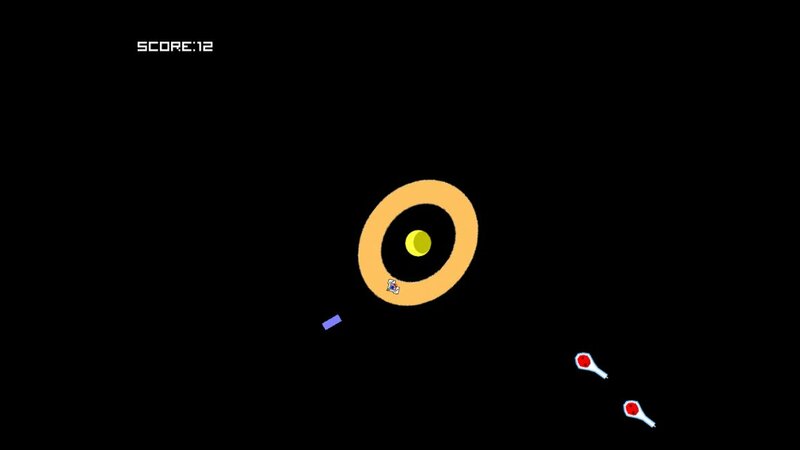 The objective of the game is to shoot asteroids while still being within the ring of the saturn. If you step outside of the ring, the game ends. Every time, the ring will change its angle so not only will you have to move carefully but also shoot the asteroids as well. Played it for about 7 rounds before I got frustrated and gave up. The game starts off too hard. I like the concept and think this could turn into something neat. But the first few moments with the game are crucial, and they should be fun. 1. Make the first level much easier. Bigger ring, the bullets would reach until the end of the screen, enemies moving slower, etc. 2. Make the controls less finicky. Turning is very sensitive (fast), and it's quite hard to know where I'll end up at. 3. At each levelup, make something a bit harder. More enemies, smaller ring, etc. I know it can be hard to have good-looking game art, but I would start by making everything uniform - the ring has compression artifacts, and different objects have different pixel sizes. Try to create sprites with similar styles. I would also add simple sound effects. It's incredible what that does to a prototype. I'd be happy to test it again if you released another version with a bit more fun gameplay. Currently I have no plans to address the issues of the game due to lack of interest in it. That said, if I am to make a remake of it, I will keep this in mind.